Michel Tacq (Mitacq) was born June 10, 1927 in Uccle, close to Brussels, Belgium. He was a Scout in the Troop Saint Aléne where his totem was Toucan. 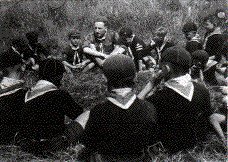 He was Assistant Cub Master (Balou) from 1951 till 1954 in the Saint Aléne pack at Saint Gilles Bruxelles. He later visited the 1957 World Jamboree at Sutton-Coldfield. 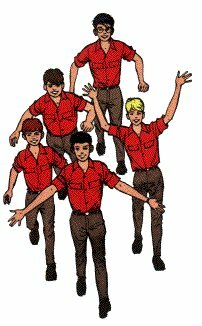 His love of Scouting would play a big role in his later comic work as an artist. Using the pseudonym “Mitacq” he published his first artwork at age seventeen, and joined the famous World Press Agency in 1947. In 1954, his collaboration with Jean-Michel Charlier took off with the publication of the first 'Patrouille des Castors' (Beaver Patrol). 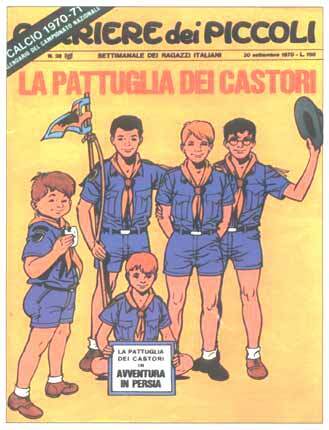 Mitacq used the neckerchief from Saint Aléne for the Beaver Patrol; yellow with blue stripe. Mitacq passed away in 1994 and the Beaver Patrol cartoon series ended. A few months after his death, Spirou magazine justly honored one of its greatest contributors by giving him a grand homage. 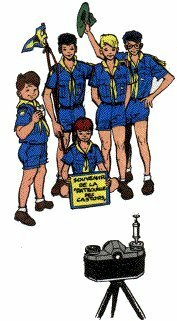 The Belgium Scouts also published his illustrations on their 1995 calendar. His books remain popular today among fans and are translated into several languages. Belgium issued a commemorative mini sheet of 9 se-tenant postage stamps on October 4, 1999 during BRUPHILA '99 [Scott# 1771d, perf, p/o 1771]. This issue was a continuation of a series of cartoon strip stamps with the theme of "Philatélie de le jeunesse" (Youth Stamps). 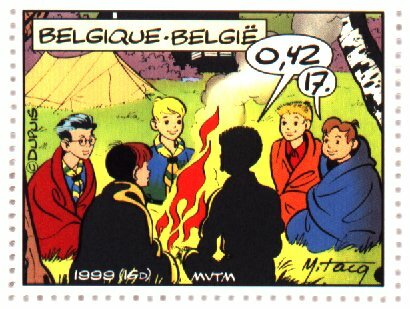 The individual stamps in this issue pay a posthumous tribute to eight masters of Belgian comic strips, including Michel Tacq - "Mitacq," The Scouts in the stamp are sitting around a campfire telling the value of the stamp: BEF (17bef), and Euro (0.42 €) each. 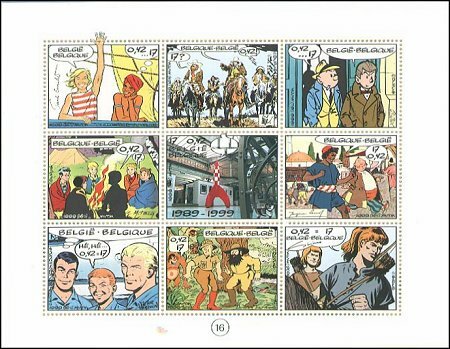 This stamp issue also marks the 10th anniversary of the "Centre Belge de la Bande Dessinée" (Belgian Comic Strip Center), a museum and research library located in Brussels. The central stamp on the sheet shows the Comic Strip Center. The issue design was by MVTM (Design Cell of The Post). The value of the 3x3 mini sheet is 153 BEF (9 * 17 bef), prices are also presented in Euro (0.42 € (Euro) each), only for information. Stamps are not sold individually. There is also a special FDC illustrated envelope issued by the post, the whole set costs 865 BEF, 21.44 EUR (for all 9 stamps). 150 jaar van de 1ste Belgische postzegel 02-10-99, Bruphila '99, Bruxelles 1020 Brussel; the logo of Youth Philately was also added. Special cancellations on 4th of October in PO Brussel 1 for first day of issue. The Belgian National Telecom operator issued a phonecard for the Beaver Patrol. The card copies a scene out of 'The Bottle in the Sea'. Only 1000 pieces were made, price 895 BEF (22.19 EUR). 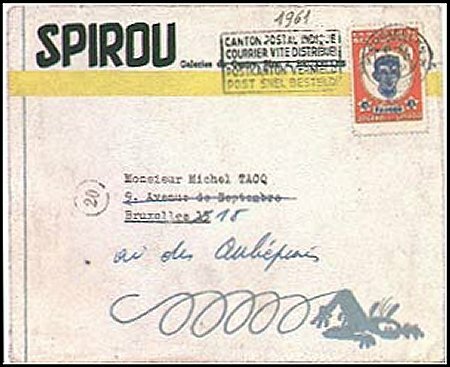 The Belgium Post printed a hard cover book for this stamp issue. "HOMMAGE 10de verjaardag voor het Belgische centrum van het beeldverhaal." Cost was 1300 ex. 750 BEF. Also available are a Dutch version : "9 Zegels Voor de 9de Kunst." French version : "9 Timbres Pour le 9e Art." Contents include a bibliography, short stories from the persons in the comics, a few comic designs, and more information about the Belgium Comic Strip Center.